Smart companies and CEOs know that success at the marketplace can be a very transient thing. Think Nokia, Kodak or even BlackBerry which have been victims of rapid change. This is particularly true of tech, where obsolescence is the norm and companies need to keep working at staying relevant in an ever-changing world. It’s no surprise, then, that the low-profile, professorial-looking Google CEO Sundar Pichai, 43, is doing everything he can to ensure that the iconic company he leads remains mindful to change and ahead of the curve. And he’s doing that by placing his bets on the next big thing: Artificial Intelligence (AI). AI, Pichai reckons, will be the driver of the new world and hence Google must come up with products to keep it in front of competition. But unlike other large companies which had to grapple with single challengers, today Google has to deal with competitors on multiple fronts. So if it’s Apple in mobile, in advertising, video and communications it is Facebook and in commerce it is Amazon, to name just a few. Hence, maintaining a lead is a must. 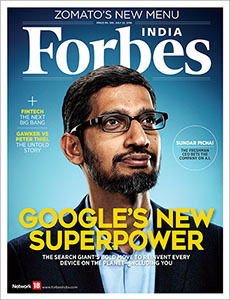 “We have this vision of a shift from mobile-first to an AI-first world over many years,” Pichai tells Forbes in the fascinating inside story of Google’s new vision we bring you in this issue. In its AI thrust, Google is up against Apple which pioneered the digital assistant category, Amazon, where large numbers of people are busy putting together an AI game plan, Facebook, whose smart chat bots are potential game changers, and Microsoft, which also has research teams constantly fine-tuning its AI and machine-learning thrust. The Google story apart, this issue also features another company in transition, this time back home in India. Food tech company Zomato, led by the aggressive, straight-talking founder Deepinder Goyal, is currently putting together a new strategy to ensure the company remains relevant in a sector which has seen several startups fall by the wayside, unable to grapple with change. The retooled Zomato game plan involves adding an online delivery piece to its portfolio (something it had shied away from earlier) and downsizing its global footprint to sharpen focus on key areas. As Deepti Chaudhary and Angad Singh Thakur tell us, Goyal is confident that this strategy will bring in what the company is desperately seeking: Profits. While the Google and Zomato stories are about change, I would also urge you to read about how billionaire entrepreneur Peter Thiel’s siege against gossip website Gawker is playing out. More storms to emerge from the Brexit tornado?